Almost hunted to extinction the Blue Whale has made a surprising comeback said the University of Washington in a recent study. Showing populations numbers close to historical levels, the California Blue Whale population recognized by the study is the only population known to recover from the practice of whaling, as well as from deadly collisions with commercial freight-liners. 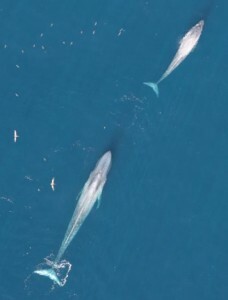 “The recovery of California blue whales from whaling demonstrates the ability of blue whale populations to rebuild under careful management and conservation measures,” said Cole Monnahan, a doctoral student in quantitative ecology and resource management at the University of Washington, and also lead author of the paper. “Our findings aren’t meant to deprive California blue whales of protections that they need going forward, California blue whales are recovering because we took actions to stop catches and start monitoring. If we hadn’t, the population might have been pushed to near extinction – an unfortunate fate suffered by other blue whale populations,. It’s a conservation success story,” Monnahan said. Read more here!